The NMRA Keystone Automotive Ford Nationals will feature one of the most talked about Ford engines during three of their most popular events in 2016. With major support from SVTperformance.com, the Livernois Motorsports EcoBoost Battle will be part of the 22nd Annual Nitto Tire NMRA Spring Break Shootout in Bradenton, Florida on March 3-6, the 13th Annual NMRA Ford SuperNationals in Hebron, Ohio on June 9-12 and finally in Bowling Green, Kentucky during the epic 18th Annual Nitto Tire NMRA All-Ford World Finals from September 29 to October 2, 2016. With Ford EcoBoost engines showing their prowess in professional endurance racing, and the performance aftermarket expanding their product offerings, it was time last year for Ford's most popular engine platform to make its mark in grassroots drag racing. Due to the success of the first Livernois Motorsports EcoBoost Battle at the NMRA World Finals in 2015, the NMRA event staff decided to continue the class in the upcoming season. "The NMRA is thrilled to continue this celebration of Ford's turbocharged small engine program with this heads-up challenge," said National Event Director Rollie Miller. "With three events this year, we'll determine the quickest and fastest EcoBoost-powered vehicle in the country." The NMRA Livernois Motorsports EcoBoost Battle is open to any and all Ford EcoBoost-powered vehicles including Fiesta ST, Focus ST, Taurus, Explorer, F-150, and Mustang. Many aftermarket modifications are permitted and vehicles must meet all NHRA safety regulations. The class will race heads-up on a .400 tree (sportsman ladder). NMRA EcoBoost Battle competitors can race two classes for the price of one! All competitors will receive a free entry into Saturday's True Street class (must fit True Street rules) for even more chances to win. 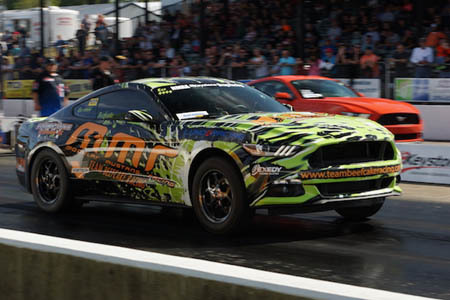 This is a $100 value as EcoBoost Battle racers join hundreds of other competitors in some of the largest True Street events of the year, presented by Muscle Mustangs & Fast Fords. For EcoBoost Battle payouts and rules, go to http://www.nmradigital.com/cat/class_rules/docs/2016/eco-prelim.pdf. For more information about Livernois Motorsports, please visit their website at www.livernoismotorsports.com. For questions, contact Gene Bergstrom at (714) 460-3813 send an email to gbergstrom@promediapub.com. For more information about the NMRA, go to www.NMRAdigital.com or call 714-444-2426.